Say you decide to make an app to educate people about how bad donuts are. Let’s call this app “Evil Donuts”. Excellent name! This is so easy to forget sometimes. Always Google and see what comes up. Then switch over to the “Image” search tab and see what comes up there. If you only manage to get one to three bikini women, it is a good sign! These are the things that would compete for SEO and the things people associate your name with. Damn it, Facebook Group is taken. Might have to name it “Evil Donuts App”. Domains are important. 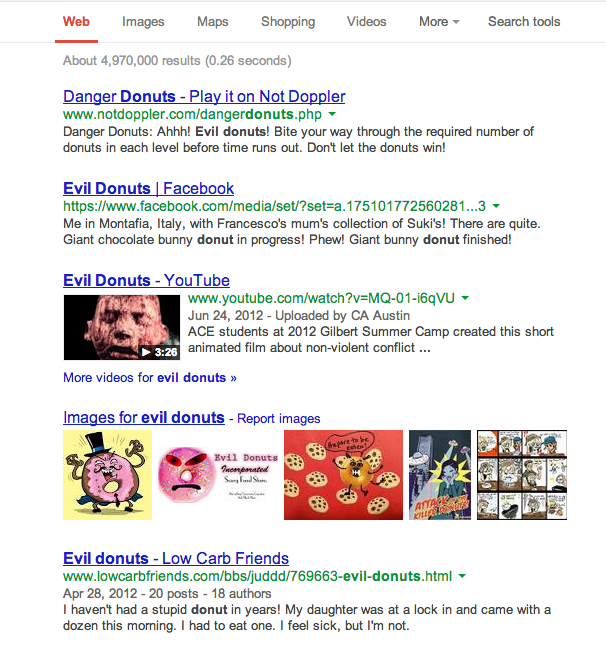 We need to look for www.evildonuts.com and www.evildonutsapp.com. These are good domains for our app, unless your aim is to introduce a submain on your own site like: www.m2d2apps.com/evildonuts. I recommend you use https://iwantmyname.com/ to look for names. It checks pretty much every domain possible. Ok let’s say this is going to be an iPhone app. We have to fire up iTunes and see if an app with that name exist. If it doesn’t great. If it does, you have to decide whether to stick with it. If you do, you can simply extend your name to: “Evil Donuts - Junk Food Eating Tips”. When the user installs the app, you can still name it “Evil Donuts” without Apple freaking out. Score! No Apps! Just like our 60Hz App! Step 4: Easy to type? We never thought about this when we launched “Notes + U”. Terrible name. Worst of all, it was hard to type on the iPhone. iOS keyboard hides the “+” button under 2 levels in the keyboard -- BAD idea. Make sure it is hard to misspell and easy to type out. Disclaimer: This is not in any way legal advice. Get a real lawyer for that. I am not qualified. This is merely personal experience. CHECK TRADEMARKS! If your app only ever sells 10 copies this is less of an issue. However, if it makes its way up the ranks and you start gaining some love from Google, then you are in for it! “Evil Donuts Inc” is not going to be nice and empathise with your situation. Trademark law, I believe, specifies that once you have a trademark, you have to actively defend it or risk losing it altogether. So chances of you getting a Cease & Desist letter is quite high. Unless you have a strong legal team you will be forced to pull your app from the store when this happens. Generally you will be forced to take down everything you have related to your beautiful app once you get a letter. Game over. If you made friends with a law grad, good for you. Love them, buy them dinner, and keep in contact. There's less likelihood on infringing trademarks if the name is descriptive. For instance, if we had named our app “Donut Nutrition Tutorials”, it is quite hard to get a C&D due to its descriptive tone. However, if we called it “DonutNutritionTutes”, then it is still under threat! Generally trademark disputes resolve in the favor of the trademark owner. So you are very likely to lose even if you contest it. Once you are happy, go ahead and create an app in iTunes to stop anyone from taking that name. Happy building apps. Evil Donuts app never did get made.